Wire Rope Assemblies – Carl Stahl Sava Industries, Inc.
Fittings are not necessarily a foreign object added to a rope, but may instead involve turning the rope back on itself and fixing the loose end to the body of the cable to create a loop. Though the fittings are commonly employed at one or both ends of a rope, some fittings are centrally located. The majority of wire rope fittings are elements of a complete wire rope assembly designed for a specific task such as motion control or mechanical automation. Wire rope fittings are heavily implicated in a number of industrial processes and equipment such as mining equipment, braking, aircraft cables, levelers, hood latch releases, and more. The versatility of fittings renders them essential to industries such as automotive, agriculture, construction, marine, aerospace, transportation, and virtually all applications where wire rope is used. 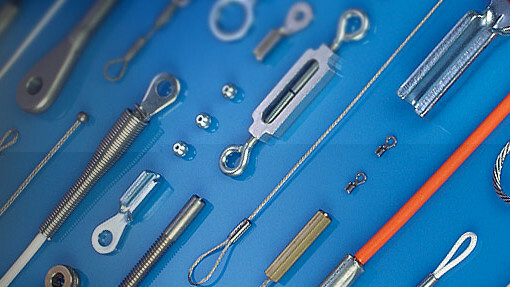 Specific examples include clamps, clips, sleeves, links, hooks, forks, eyes, studs, and pins. When used for heavy duty lifting, pulling, or other activities, fittings are often permanently attached or affixed to a given cable for added durability and security though change toolkits are sometimes available allowing for interchangeable fixtures. Wire rope manufacturers often provide a range of wire fitting options as well in order to accommodate the many different uses for the cables. Mechanical Cable Fittings – Carl Stahl Sava Industries, Inc.
Fittings function by creating an endpoint to which other apparatus may more easily be affixed or which simply preserves the integrity of a given cable by preventing fraying, a common problem for unfitted stranded wire ropes. As aforementioned, the specifics of a fitting vary greatly as does their construction, shape, and size, all of which should be carefully considered in regards to their intended use. 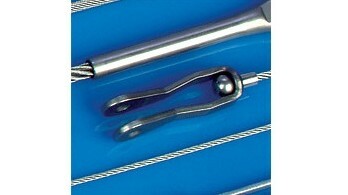 Swaging, metal stamping, and die cutting are commonly used to create the metal forms needed for wire rope assemblies. Swaging involves compressing and deforming materials to achieve a permanent connection or bonding. While stamping and cutting are used to create additional hardware, swaging is performed when no additional hardware is desired, but instead the fitting requires the rope to be folded back onto itself to create a loop or eye. Potted or poured sockets use both permanent and affixed elements as the rope end is inserted into a conical cavity that is then filled with molten zinc or an epoxy resin compound. The materials used to create the fittings themselves vary with application, but often mirror that of the wire rope or cable. Copper, brass, bronze, steel, titanium, stainless steel, and other durable metals are among the most popular. It is important to consider the integrity of the wire cable itself when selecting and applying a wire fitting as it may alter the strength, length, and dimensions of that particular section of rope. Fittings known as sleeves and thimbles are often used in complete wire rope assemblies to protect the stranded wire from wear, tear, crimping, bending, pinching, or other damage. Wire Rope Fittings Wire rope fittings are hardware components found predominantly at the points of termination on wire ropes to improve connectivity, versatility, and to prevent fraying.